Now that Vancouver Canucks fans have (we hope) managed to begin the healing process from the emotional rollercoaster of the 2011 Playoffs, it’s time to shift the focus to the 2011 Draft, where the building blocks for future success are put in place. Given that the 2011 crop has, for some time, been viewed as a generally weaker class than previous years, perhaps the Canucks would be best served to once again parlay their first-round selection in order to acquire the talent needed to win right now. But seeing as how the club already forked over their top pick last season along with Michael Grabner and Steve Bernier, perhaps its in the best interests of the organization to keep the 2011 draft choice and not gut an already thin prospect pool. In the mean time, let’s get a sense of just where exactly the Canucks are at when it comes to their top prospects. Centres: Unquestionably, this is the Canucks’ biggest strength. With Henrik Sedin and Ryan Kesler expected to play out the next five years of their career in Vancouver (and likely more), Vancouver doesn’t really have a need for some top flight talent down the middle. Because of the team depth at centre, Tony Gallagher of The Province recently posed the question of top prospect Cody Hodgson’s future with Vancouver, but don’t buy the notion just yet. Despite the fact Manny Malhotra is the team’s unequivocal third-line centre, Mike Gillis also noted that Malhotra also plays wing, which would allow Hodgson to potentially slot in the third line. Jordan Schroeder, drafted in 2009 in the first round, is another intriguing player that oozes as much talent as he does mystery. On occasion with Manitoba last year Schroeder looked like an elite-level prospect but on others looked completely invisible. It’s clear he’s still a few years away from seizing any chance at getting into NHL action. Wingers: Anton Rodin and Sergei Shirokov remain atop the Canucks’ winger rankings, with the latter finishing the season as the Manitoba Moose leading scorer (22-36-58). Shirokov’s brief audition with Vancouver this year was much better than the year prior, as he scored his first NHL goal in a two-game callup. However, the small winger still is a little fish in a Canuck pond, where the team needs for elite scoring wingers may be too demanding for him. The Canucks also recently signed left winger Steven Anthony, who played for the Memorial Cup champion St. John’s Sea Dogs. Anthony, who was once compared to Sidney Crosby not too long ago, only realized this season that success on the ice comes with hard work. The tantalizing prospect has so much skill but needs to up his compete level in order to achieve it. Bill Sweatt is the other notable winger in the franchise prospect pool, finishing second in Moose scoring. Sweatt is still a few years away from making a major contribution, however. Defense: Kevin Connauton entered 2010 as Vancouver’s most intriguing defensive prospect, and for stretches of the season carried over some of the offensive flare from his Vancouver Giants days which made him so highly regarded. Unfortunately, Connauton’s mobility has been an issue all season, resulting in a blueline-worst minus-11 rating. He’s still learning the professional game and needs more time. Connauton was instead overshadowed by the steady play of Chris Tanev, who appeared in a handful of regular season games with Vancouver as well as a few playoff games over Keith Ballard. Tanev never panics in his own end and makes a smart outlet pass nine times out of 10, which is why the Vancouver coaching staff like his future with the big club. Of all defensive prospects, Tanev is the likeliest to earn a spot next year. Meanwhile, Yann Sauve and Lee Sweatt continue to develop their skills in the AHL; both missed significant time due to injuries this season, which has stunted their professional growth. 2010 draft pick Patrick McNally just finished his first season with Harvard University. Goalie: Eddie Lack is undoubtedly the prospect who made the biggest noise this season in the AHL. 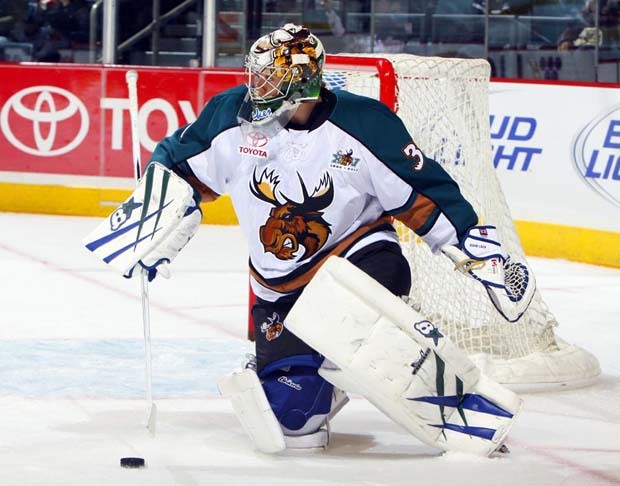 Lack was the team MVP on many nights and the sole reason the Moose made it to the North Division Final. “The Stork” arrived with little hype but all season long was so effective at taking away the bottom half of the net, forcing snipers to try and beat him glove side, which Lack has recently mastered as well. If the Canucks do decide to part ways with Cory Schneider, few would be hesitant to see Lack fill the backup void. He’s been that good. Organization Direction: At this point it becomes simply a “best player available” approach for the Vancouver Canucks. Despite their strength at the centre position, there’s little to suggest the Canucks won’ take a centre in the first round if that’s the best player available. With the team’s “win now” approach, the club could very easily swap Hodgson or Schroeder or even both if it means acquiring the kind of immediate talent to put the team over the top. That said, it’s evident the team would love to draft a winger with scoring ability or a physically mature defenseman who has a quick learning curve.